The two islands of Tatawa Besar (large) and Tatawa Kecil (small) offer some great drift diving opportunities including a seamount at Current City or Batu Bolong that is teeming with marine life. Starting at the northwestern tip of Tatawa is a good drirft dive down the western side in about 15 to 20 meters of water. 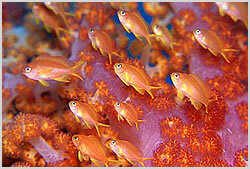 Fish life is plentiful and an endless field of stunning orange soft corals can be seen. Mantas are often seen in this area also. It is also possible to drift down the north coast of Tatawa from the same entry point. When currents are favourable diving can be good here, the best dives are down the western side of the island where rocks, caves and beautiful coral gardens in the shallows can be found. There is abundant fish life including large groupers, snappers, sweetlips, jacks, sharks and no shortage of anthias. This submerged sea mount is just south of Tatawa Kecil and offers some exhilarating diving. Huge rocks play host to swirling clouds of schooling fish such as fusiliers, sweetlips, anthias and redtooth triggers. However as the name suggests currents can be savage here so take extreme precautions. The reef is undamaged due to these strong currents and steep dropoffs, it makes conditions for local fishermen to use dynamite or cyanide difficult which is not a bad thing.